Victims of a tower block fire in the Bangladeshi capital Dhaka on Thursday may have been trapped because emergency exits were locked, officials say. At least 25 people died and 70 others were injured in the blaze. Six of the victims are believed to have fallen to their deaths when they jumped from the burning high-rise building. 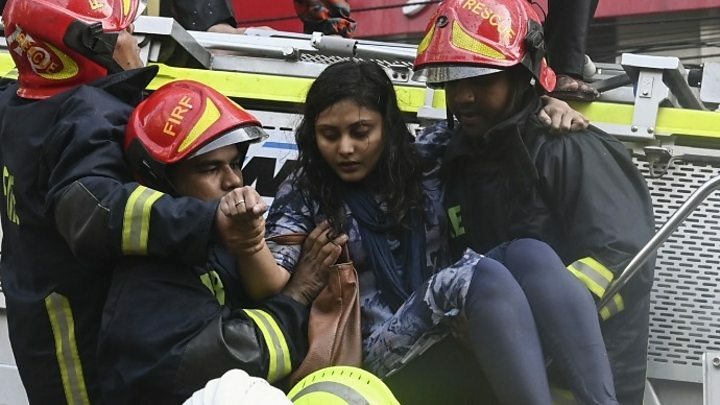 Shajahan Shikdar, from Dhaka's fire department, told the BBC's Bengali Service that there was also a shortage of fire safety equipment inside. It is not yet clear what caused the fire in the commercial district of Banani. The government has ordered an investigation. The fire broke out at about 12:50 local time (06:50 GMT) on Thursday, quickly engulfing the high-rise property and trapping people inside. Many are believed to have been stuck on the upper floors of the building, above where the fire had started. "The fire safety system of this building was not satisfactory," Mr Shikdar told BBC News. "There was only a narrow, two-feet-wide iron staircase available as a fire escape, but it was found locked on different floors. So the people in this building were not able to use it during the fire." According to Bengali newspaper the Daily Star, it took 22 firefighting units, backed up by the army, navy and air force, to tackle the blaze. Military helicopters were seen dropping water on the building from above, and rescuing people from the rooftop. The fire was eventually brought under control at 16:45 local time (10:45 GMT), after almost four hours. The Bangladeshi capital is a city of high-rise commercial and residential buildings - but how many of these buildings strictly adhere to the government's building code is a big question. It is not uncommon to see emergency exits locked or unwanted office furniture and other junk dumped near fire doors. In some places, the fire exit stairs are so narrow that it will be difficult to navigate through them even under bright light. Some buildings do not carry out regular fire drills or organise awareness programmes for its occupants. In some buildings, steel ladders are used as fire exits and I have seen them particularly in some clothing factories outside Dhaka. In the latest incident, the fire service officials said, even those ladders were locked. Rescue teams also found that there were no water sprinklers inside the tall building. It is still not clear what caused the blaze. The government says a case will be filed against the owner of the building. But there will be questions on how such a commercial building without proper fire safety measures was allowed to operate all these years. Mostaq Ahmed, from the Dhaka Metropolitan Police, told local media on Friday that 25 victims had been recovered and identified, and that all but one had been handed over to their families. He added that officials from the fire service were still inspecting the building, and that the police would take over shortly afterwards. The fire service initially put the death toll at 19, but on Friday the police confirmed that at least six more people had been killed. Another 70 people are being treated in hospital, with one person said to be in a critical condition.